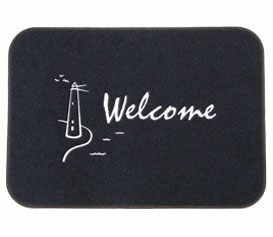 Our plush Lighthouse Welcome design boat mat is perfect for a housewarming or boatwarming gift. Our boat mats are made from beautiful yet durable marine grade carpet that's mold, corrosion and UV resistant. Our very own special vinyl composite backing ensures that your boat mat will stay in place without leaving a mark. We use the finest threads on our embroidered boat mats to ensure that your mat stays looking sharp! Makes a great gift. A must have for every boat or front steps! Show off your boating lifestyle with this tasteful mat. 100% recycled materials in the USA. Safe on all boat types, including teak. Available in Tan/Black or Navy/Silver. No customization is available for the lighthouse design boat mat. *Volume pricing available on orders (24) or more, email sales@ssnautical.com to find out more.